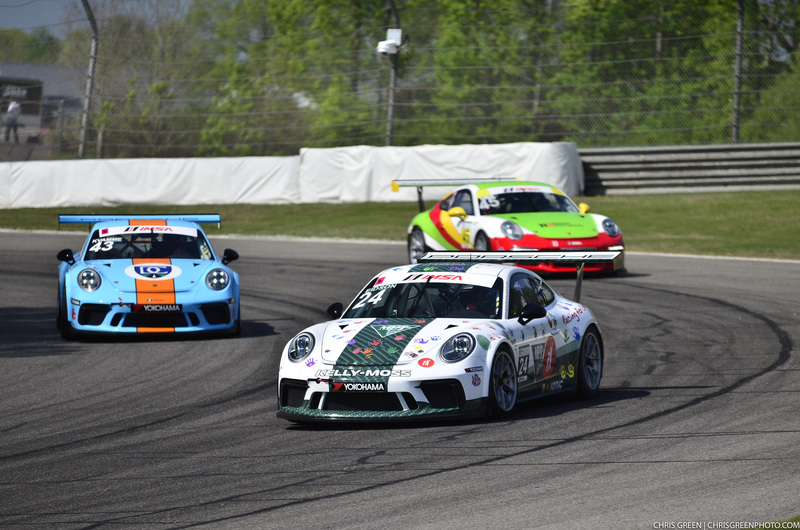 Birmingham, Ala. (24 April 2017) – Jake Eidson led the Kelly-Moss Road and Race (KMR) effort over the weekend at Barber Motorsports Park as the IMSA Porsche GT3 Cup Challenge USA presented by Yokohama staged Rounds 3 & 4 of the 2017 championship. Eidson dominated the weekend, starting both races from the pole position and leading every lap on offer to take home two victories in his No. 24 Kelly-Moss/Racing for Children’s Porsche entry. There was yet more champagne to spray as KMR pilots Kurt Fazekas and Colin Thompson also scored podium finishes in Alabama, with Fazekas placing third in the first IMSA GT3 Cup race while Thompson finished third in the second IMSA Prototype Challenge presented by Mazda event of the weekend. 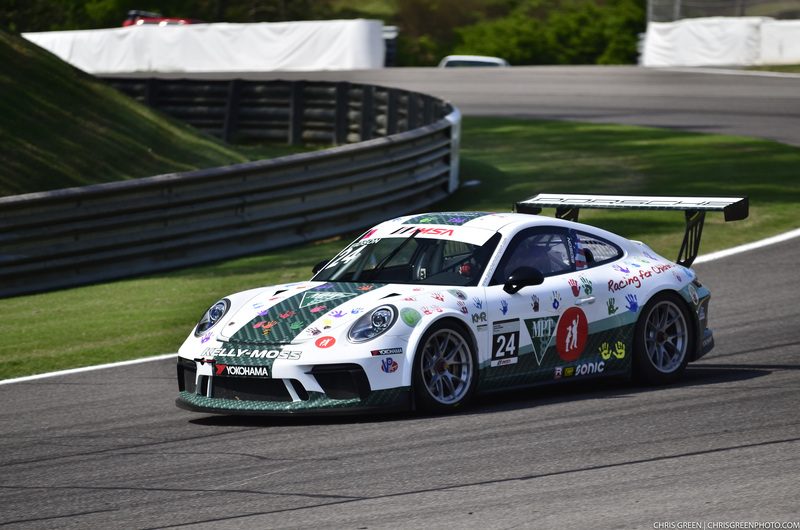 Kelly-Moss Road and Race fielded four IMSA Porsche GT3 Cup Challenge USA presented by Yokohama entries while the team also continued its development of the Norma M30 in the IMSA Prototype Challenge presented by Mazda series. The IMSA Prototype Challenge presented by Mazda will next be in action at Watkins Glen International on June 29 – July 2. 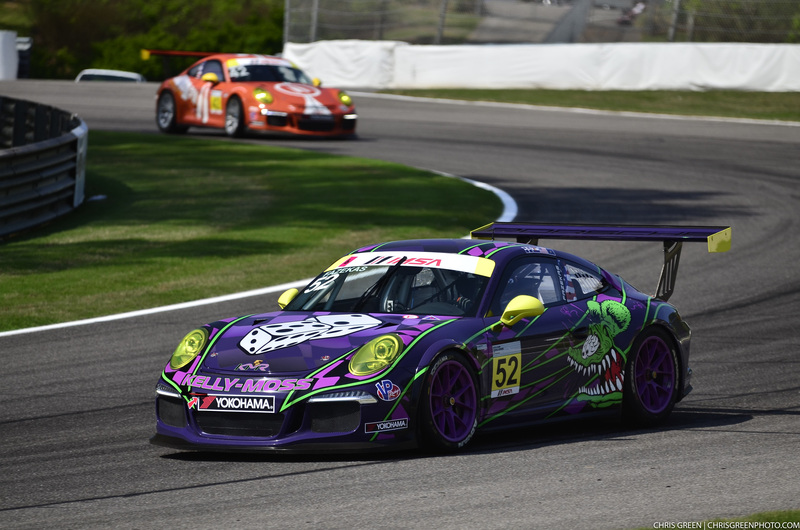 The IMSA Porsche GT3 Cup Challenge USA presented by Yokohama will next race at Circuit of the Americas in two weeks’ time, May 4-6. 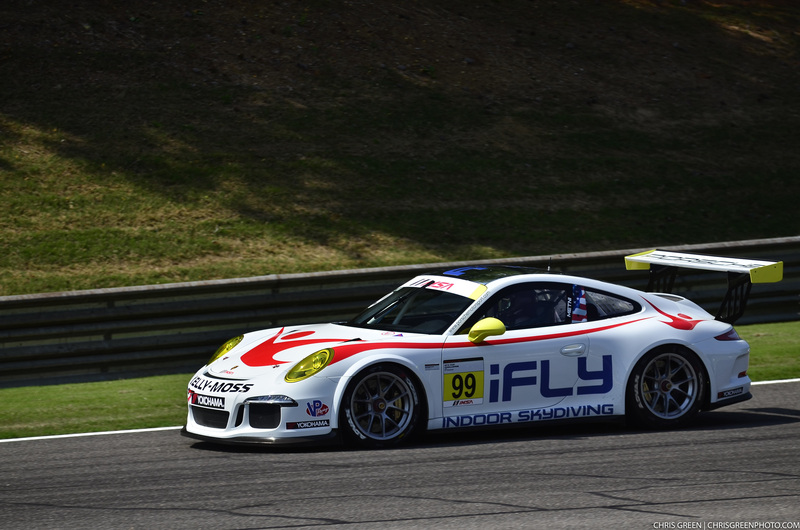 The first IMSA Porsche GT3 Cup race of the Barber Motorsports Park weekend marked a dominating run for series rookie Jake Eidson, who put on a clinic at the Alabama road course. Claiming the pole position, Eidson started from the front row and never looked back, extending his gap over the field to over nine seconds throughout a long green flag run. Despite two late-race caution periods, Eidson make it look easy as he extended the gap by a few tenths with each lap of the circuit. The race ultimately finished under caution, with Eidson taking the checkered flag first in line. Eidson hosted a group of children from the Children’s Hospital of Alabama who were thrilled that the winning car carried their handprints and signatures after the team visited the hospital on Tuesday. Meanwhile, Kurt Fazekas took third in Gold category – his third podium result of the year. He enjoyed mixing it up with the sister No. 99 Kelly- Moss Road and Race entry as the two ran together for some time in his debut at the Barber Motorsports Park road course. Greg Palmer, who made his first IMSA race start at Sebring, continued to show progress in the No. 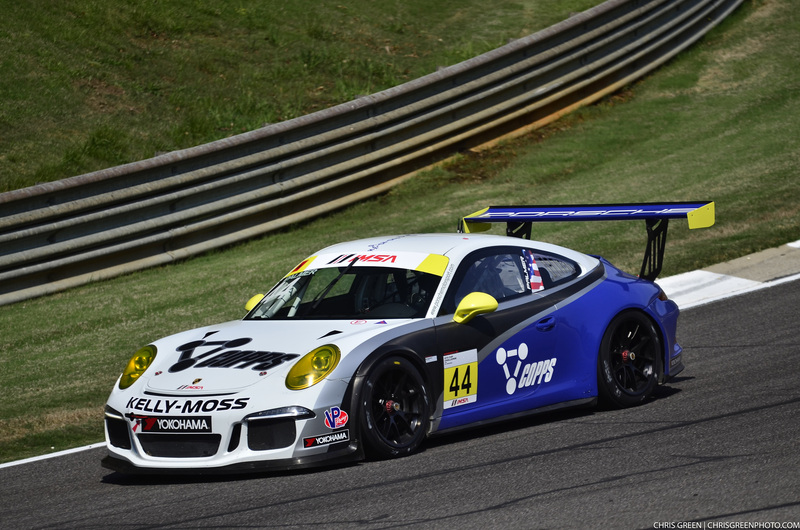 44 Copps Industries Porsche as he completed the Barber race trouble free by putting down clean and consistent lap times. Sunday brought drastically different weather and track conditions from Friday and Saturday’s heat and humidity, as a storm system moved into the Alabama area with rain and much cooler temperatures. 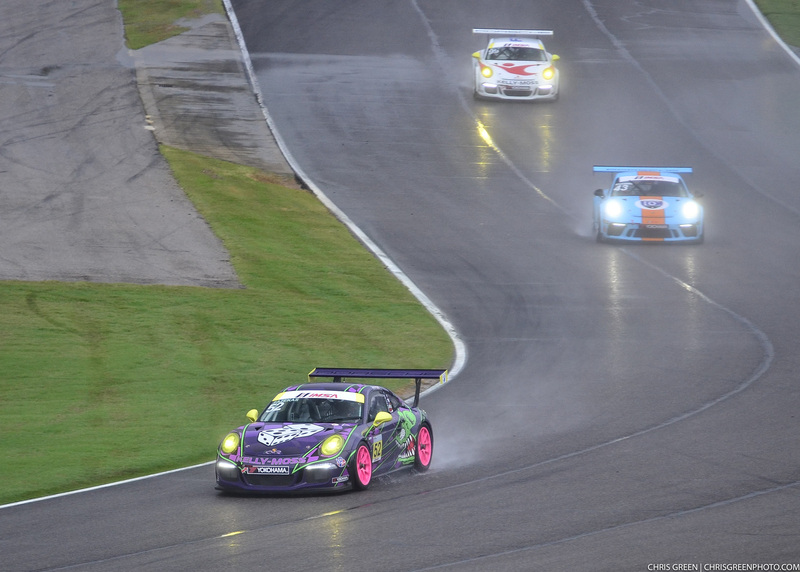 The second race of the weekend opened under caution due to the rain around the circuit, but when the field went green, Eidson once again put on a show. 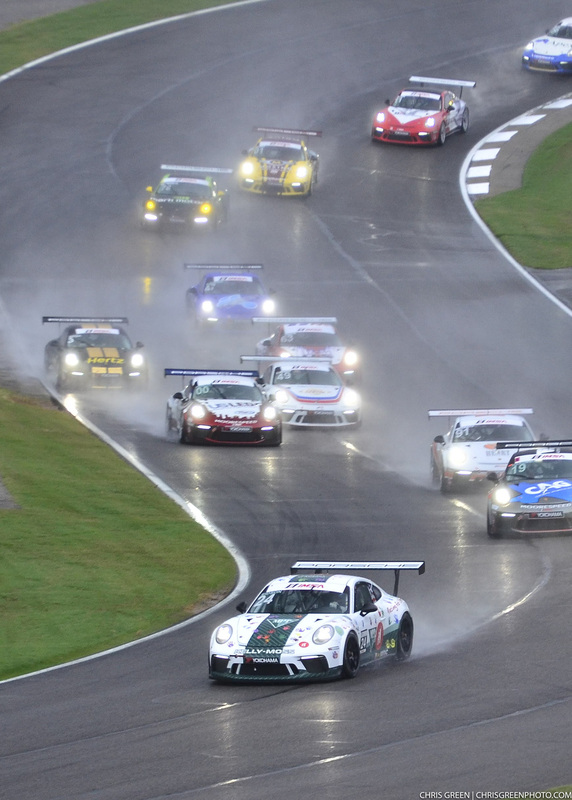 Despite the rain, which presented challenging driving conditions and a ‘green’ track, the No. 24 Kelly-Moss/Racing for Children’s Porsche immediately gapped the field with Eidson eventually extending his leading margin to over 15 seconds. Meanwhile, fellow Kelly-Moss Road and Race competitors Kurt Fazekas and Greg Palmer were completing consistent lap times in the Gold class – each targeting another solid finish in difficult conditions. Unfortunately, those tricky track conditions caught Palmer out near the end of the race which brought out a full course caution and ended the No. 44 Copps Industries Porsche entry’s day early. The race finished under the yellow with Eidson taking the victory and Fazekas earning fourth in the Gold class. Colin Thompson put the No. 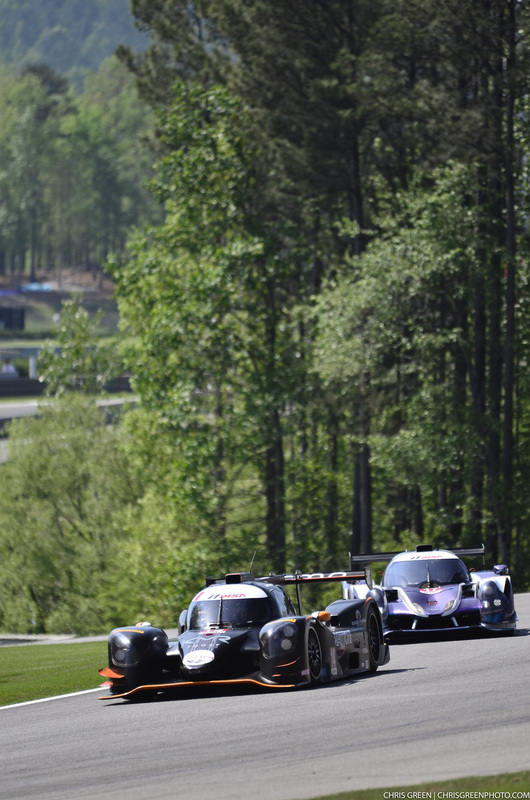 14 Kelly-Moss Road and Race Norma M30 third on the grid for Friday’s 45-minute sprint race at Barber Motorsports Park. Despite showing promising race pace through the beginning stages of the event, the Norma sustained slight contact in the tight confines of the Barber circuit which was enough to affect the handling of the machine. Thompson hung on for fourth at the finish with hopes of a positive outing in Saturday’s Race 2. Race 2 on Saturday saw Thompson open the race from the pole position. He put the Norma M30 in strong position as he led through the opening stages. About half-way through the race, a full course caution bunched the field back up and when the race went back to green, Thompson went into defense mode. Unfortunately, as he made his way into Turn 5, the No. 14 machine got caught out on the dirty part of the circuit which saw Thompson slip to third in line. 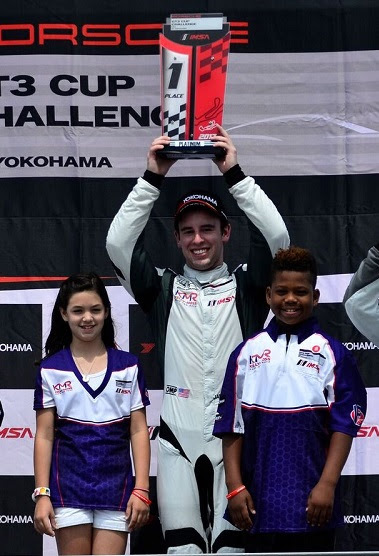 Maintaining position up until the checkered flag, Thompson took home his second podium of the year with a third place finish – after having taken a runner-up finish earlier this year at Sebring.